ATLANTIC—Though United We Fight (UWF) may currently be the largest guild on the Atlantic shard, this was not always the case. When UWF was founded in October 1999, its entire membership consisted of only two members. Over the past decade, UWF has witnessed many challenges, including changes in leadership, shifts in focus, and even guild splits. 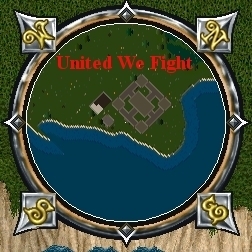 However, thanks to the unique culture of personal ownership cultivated by its members, as well as an absence of heavy-handed rules, UWF has grown to become one of the largest guilds in the history of Ultima Online. The guild was initially founded by Greendragoon, whose mission was to create a primarily player versus monster (PvM) guild that specialized in training new players. At its founding, the guild’s charter was “Friends First.” Greendragoon led the guild until 2005, when he passed the mantel to UWF’s current guild master, Dragging Canoe (DC). 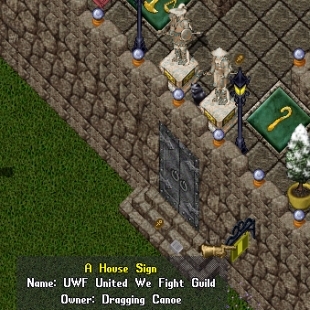 When DC first assumed leadership, the guild was experiencing some instability due to overextension, as UWF attempted to be all things to all people. DC helped returned the guild to its original PvM focus, clarified the guild’s objective, implemented a simpler code of conduct, and reorganized the guild’s structure to place more leadership responsibility in the hands of its members. As a result of these changes, UWF has grown to become a larger and more stable organization. Following the departure of the player vs. player (PvP) wing, DC redefined the guild’s charter to focus on fun and fellowship. The guild’s current motto is, “Fellowship, PvM, and we still train the best!” Aside from the refocusing of UWF’s mission, other aspects have helped to contribute to the guild’s success. “Another important factor is the wide range of activities available thanks to the willingness of members to share their knowledge and expertise,” said DC. UWF offers nightly guild hunts to various locations, including peerless instances; the Ilshenar, Malas, and Tokuno champion spawns; the Doom gauntlet; and hunting hot spots throughout Britannia. The path to UWF’s success has included many obstacles. When UWF was smaller, three guild splits threatened UWF’s stability; as UWF grew larger, it became a prime target for player killers and thieves. When UWF was first founded, its formal leadership truly ran the guild. They were responsible for recruiting prospective members, training new players, organizing events, and overseeing the day-to-day operations of the guild. As UWF grew, this job began to overwhelm the formal leadership, leading to an evolution in its structure. Due to its focus on PvM events in the Trammel rule set, UWF does not appeal to all players. However, it has managed to create a unique atmosphere. One thing that sets UWF apart from many guilds is the absence of heavy-handed rules. UWF only has three basic rules, which include: 1) do not kill guild mates, 2) do not steal from guild mates, and 3) mind your P’s and Q’s in guild chat. Otherwise, UWF members are free to play as they choose, including becoming members of other guilds who focus on PvP and Felucca-based events, as UWF does not offer these activities. United We Fight has been an active presence on Atlantic for over a decade. UWF’s current guild master, Dragging Canoe, has been leading the guild since November 2005.